The system features an electronic load cell for accurate and reliable measurements of isometric strength and a Nexus tablet that interfaces with the load cell via Bluetooth. The system is designed to meet the needs of Jackson lift, torso and pull strength test protocols, and the lift tasks of the National Institute of Occupational Safety and Health (NIOSH). WHY SHOULD I USE ISOMETRIC STRENGTH TESTING? Isometric strength is defined as the maximum force that a muscle group can exert without movement. Tests of isometric strength are easy to perform as they require only a single, maximal contraction. 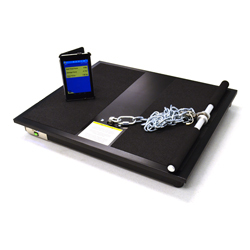 Bottom line: Isometric strength testing is inexpensive and flexible. Isometric strength tests are often favored because of the ease of use and the quick manner in which the maximal capacity of a muscle group can be determined. By creating the proper test environment, many different types of strength can be evaluated.